Infrastructure Management is the systematic, proactive and immediate technical support for your network, servers and workstations, managed by our certified IT Professionals and Support Staff. The end result of a network maintenance plan is an office that is happy and productive. If you have always thought that there must be something better than the break-fix approach your current IT support provider is giving you, then you will love our method to supporting your company’s computers. Features of a Infrastructure management Plan. Because of these and other factors, your computers require regular computer service maintenance to keep the big problems away and maintain optimal performance. This program is often referred to as a computer maintenance contract, service level agreement, or computer network maintenance plan. What is Monitoring and Why Is It Important? 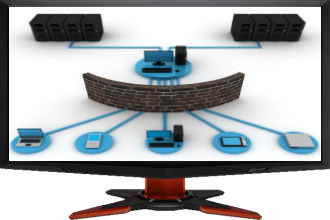 Corporate Monitoring allows us to monitor your server every business day of the year. It also allows us to proactively track and manage business critical elements of your server between scheduled Maintenance visits. Corporate Monitoring provides visibility into your network allowing us to more quickly determine and address the root cause of many server issues, and reduce the task of issue diagnosis. This results in cost savings and reduction of downtime. Contact us if you are ready to begin enjoying a new level of consistent, proactive support for your company.